It rained all night last night. We lost power for several hours, but it was back on when we woke up this morning. The rain changed to snow after dawn, and continued lightly for about an hour. Now the temperatures are rising (high 30's) and the warm air hitting the snow on the ground creates what we call "snow fog" - a low mist that settles over the ground everywhere. Sometimes rather eeire, sometimes quite lovely. Everywhere the snow is melting, and bare patches are beginning to pop up here and there, mostly around the edges of the snowbanks. And, anywhere there is bare dirt, it is MUD. Here in New Hampshire, we have a whole season devoted to mud. It's a short season, perched somewhere between the snow melt of late winter and the real beginning of spring. We plan around it. We say things like, "Once mud season is over, we can get the tractor out." or, "When mud season hits, I know it is time to plant the lettuce in the cold frames." Mud season is the enemy of any animal enclosure. It is not good for ANY critter to have to stand around in mud. So the homesteader has to provide some dry mulch to keep animals out of the mud as much as possible. Its an every day chore. A single milk cow might need 50 pounds of hay or straw every day laid down in her pen. Since we are are only dealing with chickens right now, my quantities are not that drastic, but I still have to fork out and spread some straw in their run. The last two days I have not let them out because I am away working and cant' keep an eye on them. Plus, it has been raining and they are not always smart enough to get out of the weather. I just try to keep as dry a layer on top as possible so they are not constantly walking around with wet feet. I wouldn't like that either if I were them. But, don't get me wrong. We welcome mud season, as it is the signal that long awaited spring is finally coming. All of a sudden, on a sunny day in late March, you just might walk outside and smell EARTH... that wonderful, composty, sweet, pungent smell of beautiful beautiful dirt and all the life within it. After a long winter, THAT is something to cherish. I have been working all week, filling in for a friend at a gallery, while she is off gallivanting in France or some such place. So, not much work has gotten done around here. But i did do a much-needed cleaning of the chicks cage today. I moved a few things around, removed one of the heating units, as they don't need it so much and it takes up space their growing selves can use now. It's been about 15 minutes and they have already made a total mess of the clean cage. The clean litter seems to awaken their scratching and pecking instincts, and they toss pine shavings everywhere in their frantic search for something under the litter. Even more, the clean soft litter brings out their desire to have a bath. 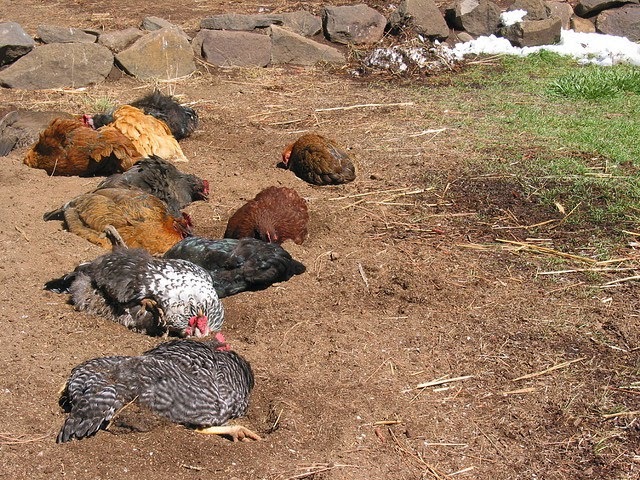 Chickens bath with dirt. This is an important part of keeping them healthy, actually, as it is how they rid themselves of excess skin oils, feather mites and other parasites. If you have ever seen a chicken taking a dust bath, it is pretty funny, and they look about as content as you could ever hope to see. No, they're not dead, they are enjoying a nice dust bath. The chicks do this too. Only, with 26 of your brothers and sisters all crowding in and stepping on you as you try to bathe, well, it's not quite as easy as you might think. So, today's chick flick is watching some of the dust bathing activity.